All during our trip, there were problems with airline and train travel in Western Europe. With plenty of snow and ice, delays and cancellations were the norm. But besides our little Amsterdam to Brussels train adventure, these problems had always effected other people. We had a full schedule on the last day of our trip with the highlight being the ‘lambic tripleheader.’ Our day would start at Cantillon in Brussels. 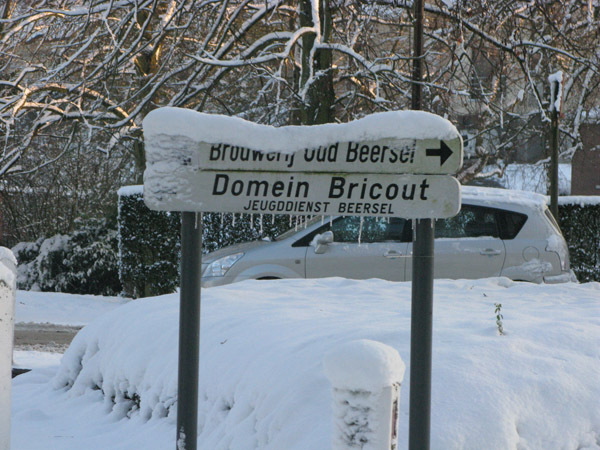 We then would take the train to Beersel to tour Oud Beersel and eat dinner at the Drie Fonteinen cafe. The only thing putting a damper on the big finale was the cold that Merideth had been fighting for the previous few days. She was no longer fighting it, Merideth was sick. Cognizant of the air travel problems, I checked to see if our flight got out on Monday prior to leaving our hotel for the day. The flight to Chicago departed a few minutes late, but I left our hotel feeling pretty confident that we would be home the following day. Walking out of our hotel, we were greeted with a rare sight on the trip, the sun. 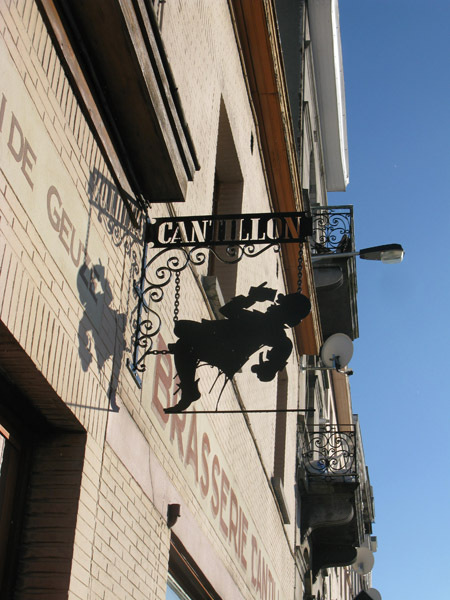 From Place Rogier, it was a half hour walk to the Anderlecht neighborhood, the home of Cantillon. 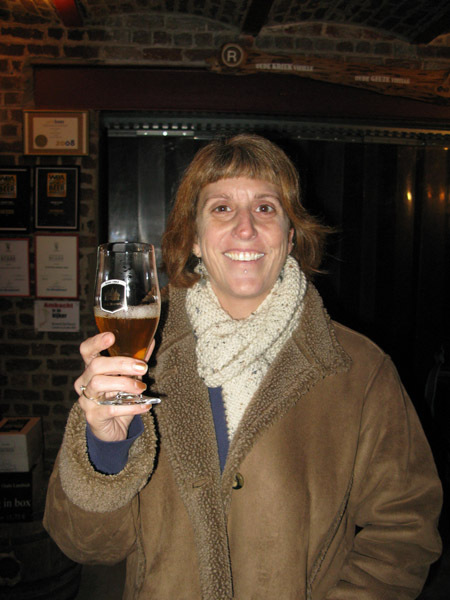 We visited Cantillon on our day trip from Paris in 2004. But as Merideth observed, we really didn’t understand the magnitude of the place then. Six years later, we were very aware of the living history. Though ‘only’ a little over a hundred years young, Cantillon looks and feels old. Our entrance was perfectly timed. As we entered, a barrel appeared out of the cellar being lifted to the upper level. After the awe of being back at Cantillon subsided, our next observation was “Gee whiz! It’s darn cold in here…” We joined a half dozen other people in the sitting area clustered around the wood stove. We did the tour back in 2004, so we opted just to have a few beers. 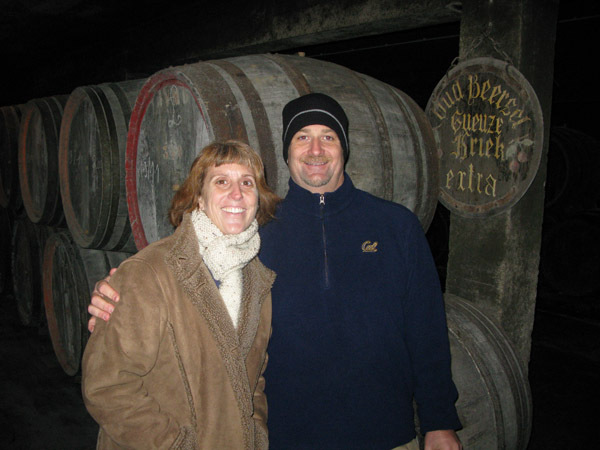 Though many of Cantillon’s beers are readily available in the States, the experience of drinking it at the brewery hovered around a wood stove for warmth is what beer travel is all about. Beginning with the Gueuze, we followed that up with a two year old Lambic served from a ceramic jug. The oddest beer was the Faro, our first ever. (A Faro is a Lambic with unrefined sugar added) Flat and sweet, Merideth compared the taste to that of a wine cooler. I somewhat agreed. My favorite was the wonderfully tart and dry Kriek, our last beer. It was while we were drinking our last beer that I received the call from American Airlines. Seeing the number on the Caller ID, I immediately realized they weren’t calling to say we had been bumped up to first class. As I expected, the robo-voice on the other end said that our flight to Chicago was canceled and that they were working on re-booking us. We were concerned and a bit worried at first but decided to continue on with our day as planned. We would deal with getting home when we got back to the hotel. It was a short walk to the Midi train station, our departure point for Beersel. Midi was crazy and full of travelers trying to get to their Christmas destinations. Seeing the long lines at the train station got me thinking and feeling quite anxious. On the train ride to Beersel, I began to question whether our decision to continue on with our day was the correct one. 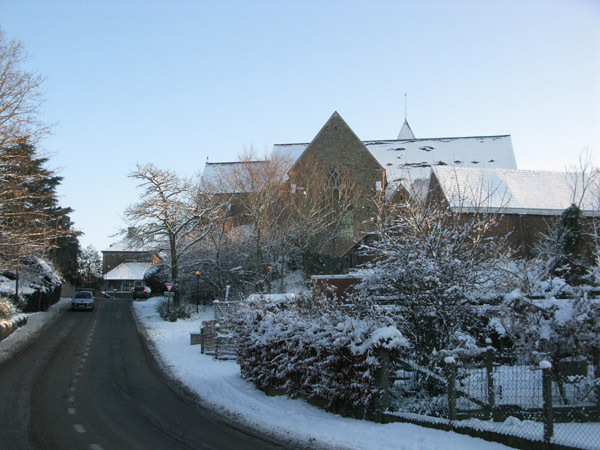 Walking up the hill from the Beersel train station, we entered a snowy, peaceful and quiet village. It was really hard to fathom that we were only six miles from bustling Brussels. We still had a few minutes before we had to be at Oud Beersel for our tour. A quick beer at Drie Fonteinen was in order. As we approached the cafe, we got a bad feeling. The parking lot was empty, the cafe was dark. 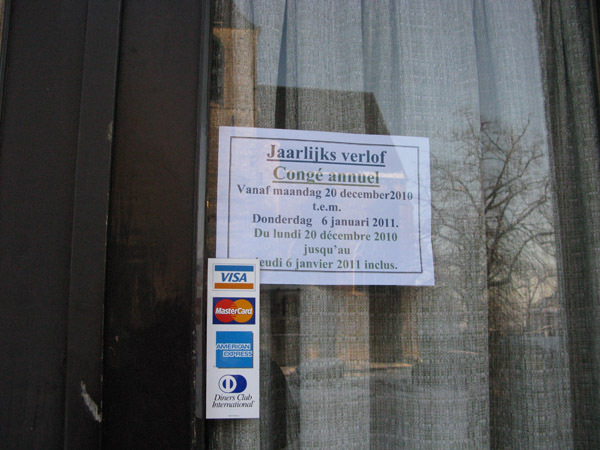 The sign on the door confirmed our second disappointment of the day, Drie Fonteinen was closed until January 6th. Passing through the village and into a more residential part of Beersel, it was another fifteen minutes walking to Oud Beersel. We trudged along the snowy sidewalks making our own paths through the uncleared snow. As my shoes started to soak through, all I could think was what a pleasant walk this would be in the summer. Arriving 15 minutes before our tour, we recorded some beergeek.TV footage while we waited for our tour guide to show up. The brewery is only open the first Saturday of each month so we organized our tour through De Geuzen van Oud Beersel, a group founded in January 2007 to promote local traditions, including the brewing of Lambic beer. Our guide, Werner, was right on time and we started what would be our coldest beer tour ever. Early in the tour, we received the final bad piece of news on the day. Due to health laws, brewing is no longer done in Beersel, but down the road at Boon. The Beersel site only being where the lambic is barrel-aged and then blended. For us, that meant Oud Beersel couldn’t be counted on the List. We persevered through the third setback of the day and soaked in all the history. Before our tour, Werner poured us their Oude Lambiek. The brew is packaged like boxed wine (“Bag in a Box”) and is their effort at wider distribution of their Lambic beer. Since it’s not carbonated, it sounded like a good idea to me. And it tasted just fine as well. Werner walked us through the historic brewery, explaining the uses and purposes of the vintage brewing equipment. He also told a wonderful story of community pride. Founded by Henri Vandervelden in 1882, the family went through three generations brewing Lambic beer. But the brewery closed in 2002. Two local men, Gert Christiaens and Roland De Bus, wanting to preserve the tradition in Beersel, took over the brewery in 2005. 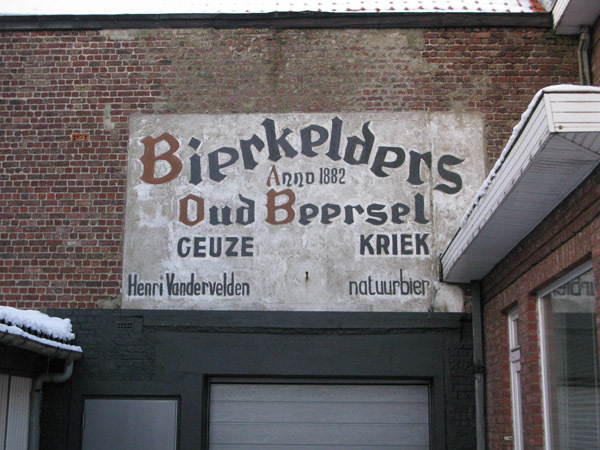 Rebranded as Oud Beersel, a year later, Oude Gueuze and Oude Kriek was sold again by the brewery. 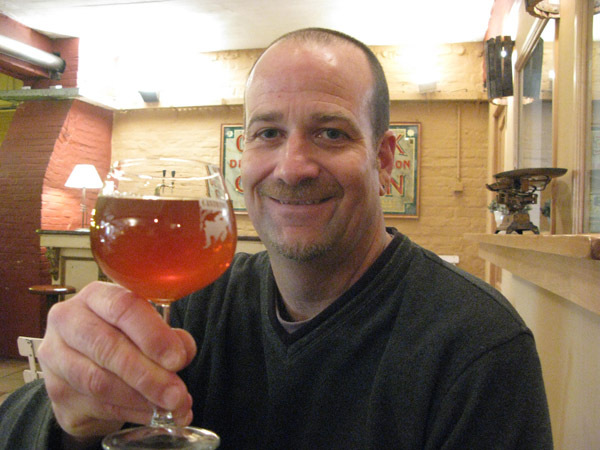 After the tour, we sampled the Oude Gueuze and Oude Kriek. We have had both these beers before but not in this setting. Ever the Kriek-head, I absolutely loved the Oud Beersel’s version. Using 400 grams of cherries per litre, the brew had a wonderful, dry fruitiness. Unfortunately, after an hour and a half inside, we were frozen to the bone. Plus, we had that whole issue of getting home to deal with. We thanked Werner for his time and apologized if we had acted a bit distracted. We walked out into the night and back to the train station. Back in our hotel room, which would be the world headquarters of thebeergeek.com for five days, we learned our fate. 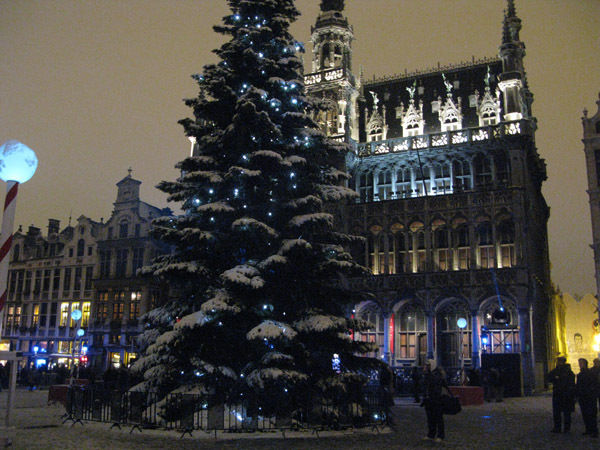 We were stuck in Brussels one extra day. Yes, there are worse places to be stranded, but stranded we were. Thankfully, we were still in our hotel and they could accommodate us an extra night (Big thanks to the Hilton in Brussels for being so helpful!). And much to our relief, our house sitter could stay as long as we needed (thanks Lilly!). The worst part of being stranded, no matter where you are, is the uncertainty of it all. We wanted to be home for Christmas but more bad weather was coming in. Who knew when we would actually leave. In fact, our re-booked flight was also canceled, we would now fly home Christmas Eve Eve. In a perfect world, this would have been a great opportunity to try to reach 600 breweries. I was at 598, Merideth 597. If we were feeling adventurous, we could have hopped on a train to visit some nearby Belgian towns to get the necessary three breweries. But neither of us were feeling adventurous. The trains were still messed up and Merideth was still sick. 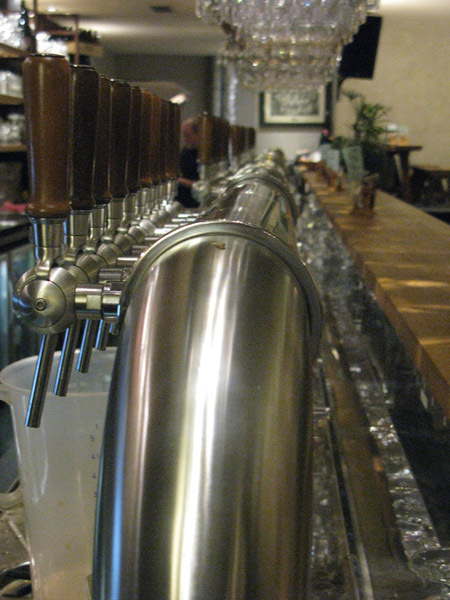 We decided to hang around Brussels and check out some of the beer bars. 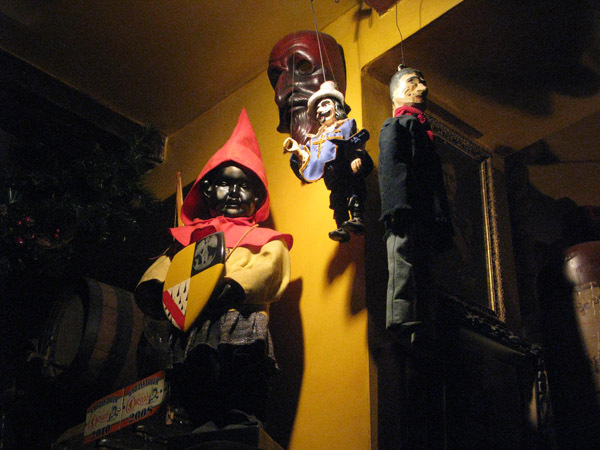 Located across the street from Manneken Pis, Poechenellekleder was not for the person afraid of puppets. The dimly lit old pub was full of puppets and mannequins. Making the scene more odd were the strange Christmas carols which sounded like they were sang by puppets. However, there was a great beer list and Merideth and I enjoyed a few rounds. We just didn’t make eye contact with any of the decorations. My favorite old pub was Het Goudblommeke van Papier (La Fleur en Papier Dore). Quiet and friendly, the building dated from the 1700s and the pub was home of the several art movements. The oddest feature; the stairs to the toilet are so steep that there is a rope to help the customer get down them. I did the Tarzan yell several times. The draft selection was the InBev starter kit (Stella, Hoegaarden and Leffe) but the bottle list more than made up for it. Merideth drank Orval while I focused on Krieks, drinking the Oud Beersel and Boon versions. If all that wasn’t enough to win our hearts, they had cheese and dried sausage. Het Goudblommeke van Papier was also memorable for Merideth because she got her only scrabble win of the trip there. Located down a long passage, we walked by A La Bécasse a dozen times without noticing it. I found it in the Good Beer Guide while planning our last day. Since we were going to be walking by, we might as well stop. The old school cafe was dominated on one side by the huge fireplace, which unfortunately had been bricked in. A La Bécasse also had really good cheese and dried sausage. But their claim to fame was the sweetened draft Lambic. 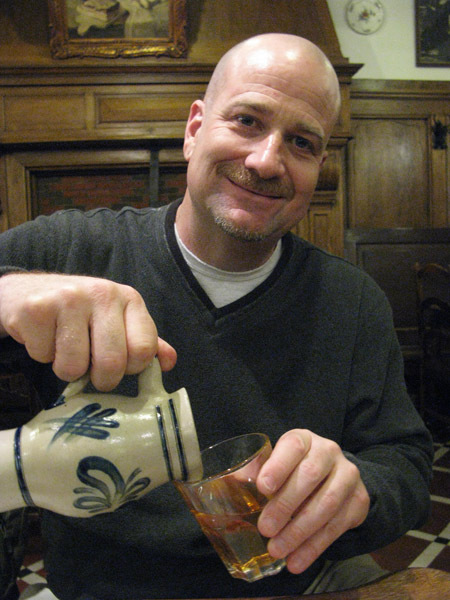 Brewed for them by Timmermans, the Lambic was served in ceramic jugs. I’ll say that I am proud to have tried it once, but I don’t think I will be trying it again. It had a sweetness that lingered and lingered which I found a bit unpleasant. We saved the best for last. 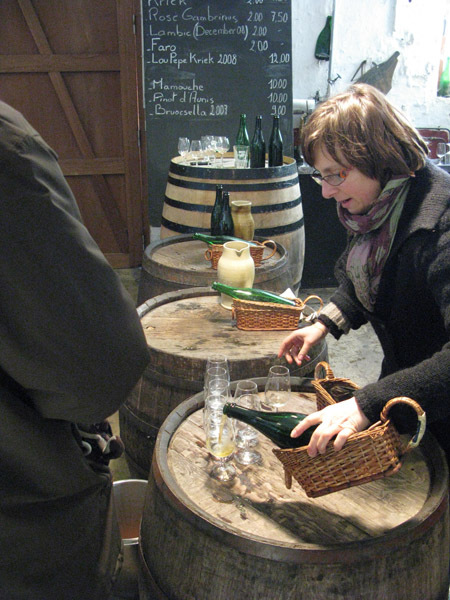 The second Moeder Lambic location, a few minutes walk from the Grand Place, opened a year ago. Very, very modern looking, Moeder Lambic had something like 50 taps, including the rare draft Gueuze, Lambic and Kriek handles. 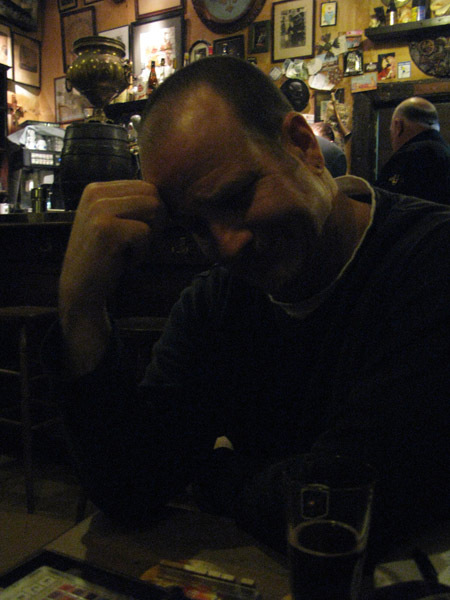 We were unfamiliar with a number of the Belgian breweries they served. The friendly staff was very knowledgeable and patient, with a willingness to help us choose. I started with Avec Les Bons Voeux from Dupont and finished with Winterkoninkskethe from Brouwerij Kerkom. In between. there was the Kriek from Drie Fonteinen and De Ranke’s Hop Harvest. I was partying like it was my last night in Brussels. Merideth was going a bit slower than myself but might have ordered the best beer on the night, Equinox from a new Brussels brewery, Brasserie De La Senne. Moeder Lambic might have been our last stop on this trip. Next time in Brussels, it will probably be our first. We did make it out the following day. Our itinerary was a bit crazy. We flew to Toronto on Jet Airways. From Toronto, we would catch a United flight to Denver and then on to Monterey. Early Thursday morning, we left our home for five days and took the train out to the airport. Everything seemed fine until our flight left two hours late. We missed our connection in Toronto. Getting American on the phone, they booked us on a flight to Chicago, then San Francisco. Our last leg to Monterey would be on United. The next two hours in Toronto would be the most stressful in all our travels. Carrying all our luggage, we had to change terminals, get our tickets, clear US Immigration and Customs and get through security. Lucky for us, the Chicago flight was held to let people get through the painfully slow process. Once we caught the Chicago flight, we were home free so to speak. Twenty six hours after leaving our hotel in Brussels. we walked in our front door in Carmel Valley. Our European Christmas Vacation 2010 was officially over. Great writeup on Brussels! I am going on a trip there at the beginning of February and I am currently doing my research on where to go. I had a question for you though, did you buy any beer to bring home on this trip? I plan on buying beers from Cantillon and others and I was wondering if you were able to ship directly from the brewery or if you had to check the bottles in luggage.